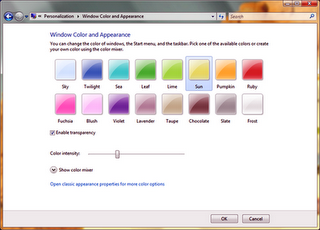 Windows 7 has about 18 colors in the window color and appearance menu . 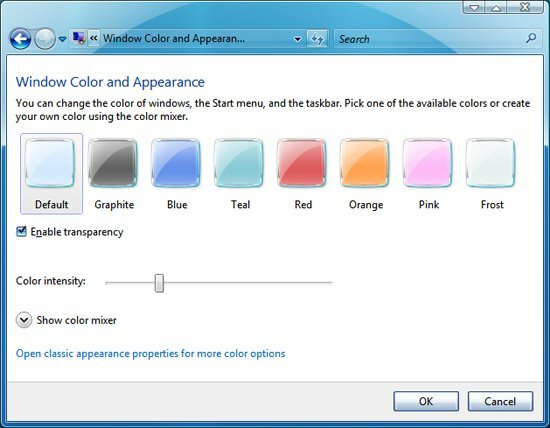 At the same time Windows vista support only 8 less attractive colors . 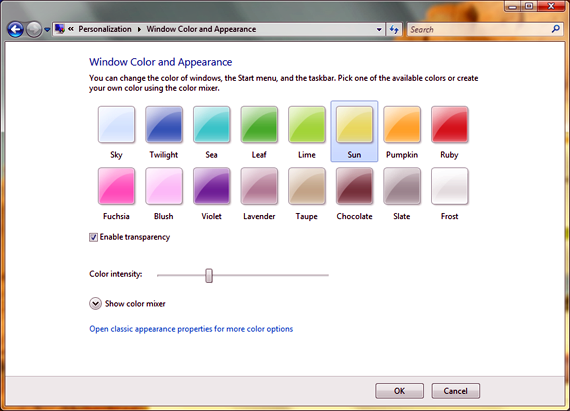 Now you can use these 18 colors with Windows vista window color and appearance . Now browse through C:Windowssystem32 and C:Windowssystem32 en-US . Here you will find themecpl.dll and themecpl.dll.mui files respectively . Now take the ownership of the two files . For that , copy the following registry settings to notepad and save as ownership.reg . Now execute ownership.reg with admin privileges. . 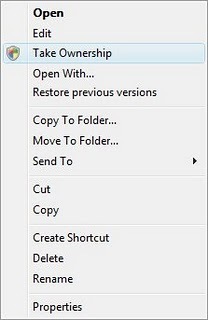 This registration entry can add a take ownership menu to your context menu for Windows 7 and Windows vista . [HKEY_CLASSES_ROOT*shellrunascommand]@="cmd.exe /c takeown /f "%1" && icacls "%1" /grant administrators:F""IsolatedCommand"="cmd.exe /c takeown /f "%1" && icacls "%1" /grant administrators:F"
[HKEY_CLASSES_ROOTDirectoryshellrunascommand]@="cmd.exe /c takeown /f "%1" /r /d y && icacls "%1" /grant administrators:F /t""IsolatedCommand"="cmd.exe /c takeown /f "%1" /r /d y && icacls "%1" /grant administrators:F /t"
After taking ownership , change the name of themecpl.dll file and themecpl.dll.mui file . Say , themecpl1_dll and themecpl1.dll.mui . Now download the following File and place the contents into C:Windowssystem32 (themecpl .dll) and C:Windowssystem32 en-US ( themecpl.dll.mui) respectevely . Then run the install.reg file in the downloaded archive . 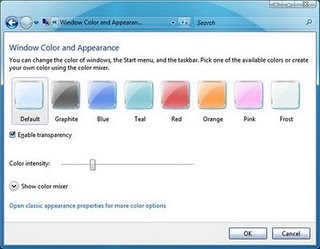 Now restart your PC to Use Windows 7 window color and apperance in Windows Vista .